Conference & Training Facilities at Trinity Business Park01924 331700work Conference non-residential venueAt Trinity Business Park we understand that everyone’s needs are different and we have a range of modern and stylish rooms in a professional environment to suit your exacting requirements. Our experienced management team will be delighted to assist you in every aspect of your event to ensure it runs as smoothly as possible. We can help you to organise everything you may need from projectors and flip charts through to flower decorations and photographers. Car parking on or close by the business park can be allocated on request. At Trinity Business Park we understand that everyone’s needs are different and we have a range of modern and stylish rooms in a professional environment to suit your exacting requirements. Our experienced management team will be delighted to assist you in every aspect of your event to ensure it runs as smoothly as possible. We can help you to organise everything you may need from projectors and flip charts through to flower decorations and photographers. Delegate packages are available for ½ day or full day and can be tailored to your individual requirements. 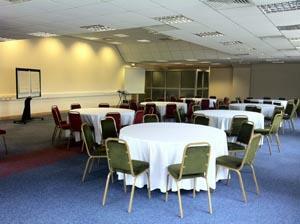 Please contact a member of our team to discuss how we can help you to organise your event.